And then, again, I want you to notice another thing, one of the fulfilling. 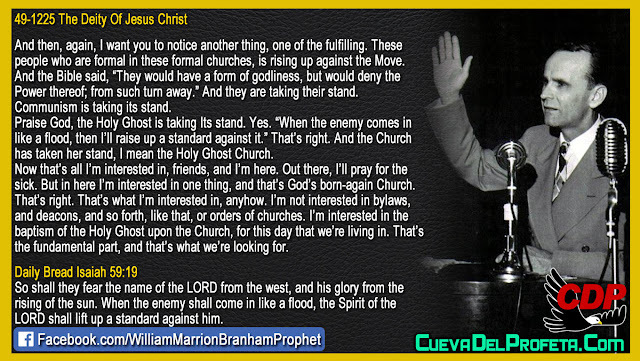 These people who are formal in these formal churches, is rising up against the Move. And the Bible said, “They would have a form of godliness, but would deny the Power thereof; from such turn away.” And they are taking their stand. Communism is taking its stand. Praise God, the Holy Ghost is taking Its stand. Yes. “When the enemy comes in like a flood, then I’ll raise up a standard against it.” That’s right. 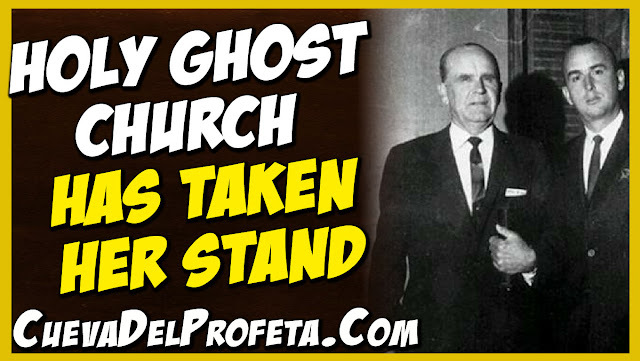 And the Church has taken her stand, I mean the Holy Ghost Church. Now that’s all I’m interested in, friends, and I’m here. Out there, I’ll pray for the sick. But in here I’m interested in one thing, and that’s God’s born-again Church. That’s right. That’s what I’m interested in, anyhow. I’m not interested in bylaws, and deacons, and so forth, like that, or orders of churches. I’m interested in the baptism of the Holy Ghost upon the Church, for this day that we’re living in. That’s the fundamental part, and that’s what we’re looking for.